When I was a kid, I expressed the typical girly interest in sewing crafts. My mother was always working on an embroidery or needlepoint project on the side and I always wanted to "help out". As an adult, I've made numerous cross-stitch and needlepoint patterns, finished latch rugs started decades ago and learned to knit. I never quite understood or mastered free-form embroidery as I'm a person that requires a structured pattern! Now Dova has expressed an interest in learning how to sew. Of course, this has nothing to do with being a "girl", but let's just say that Adam's creative outlet is solely through Legos and Minecraft. 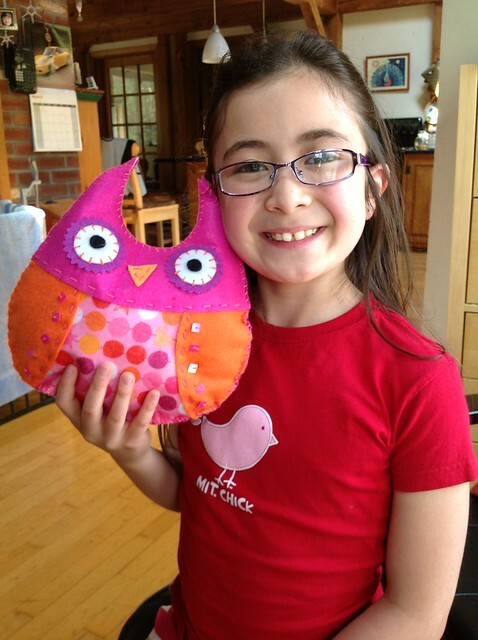 Dova completed her first sewing project, an American Girl Crafts Owls Sew and Stuff Kit . It came with precut felt pieces with beautifully stamped holes (no chads!) to guide the stitching. With some help on the first owl and minimal help on the second, she is very proud of her creation at nine years old. I had saved my very first sewing project from when I was her age and dug it out of the attic to show her. It was terrible! 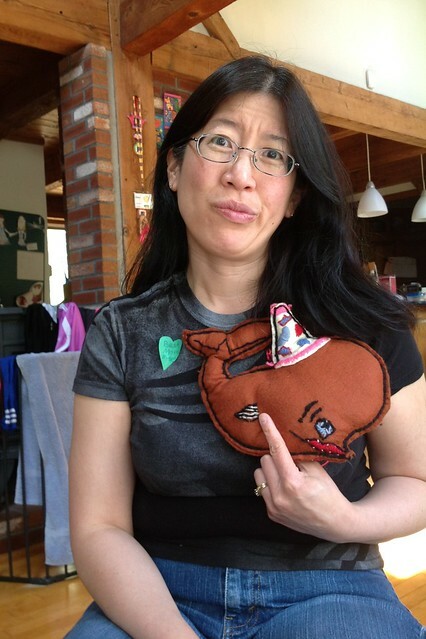 There were no stitching holes and my free form shapes on the party hat were just blobs! You call than an eye? She laughed heartily at my efforts. Was it because the kit was not as carefully designed or was it that I was a sewing klutz? 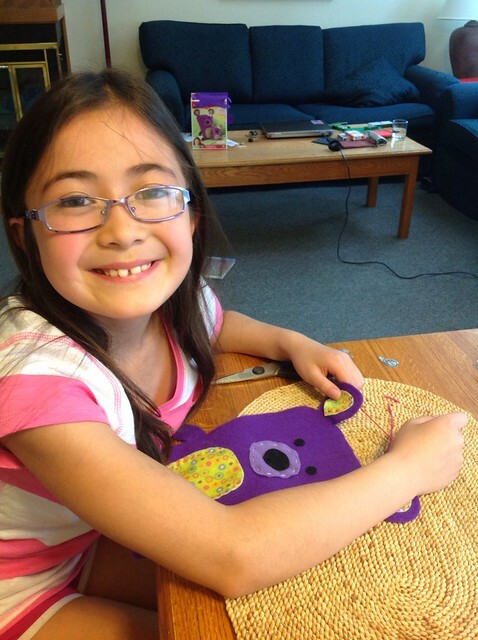 While we were on vacation, Dova worked on her second project in her free time. This time I didn't help her except for correcting the occasional mistake. She finished the whole bear during our week away. Very industrious! My stitching over vacation encompassed only five leaves on my Hancock Shaker Village cross-stitch. 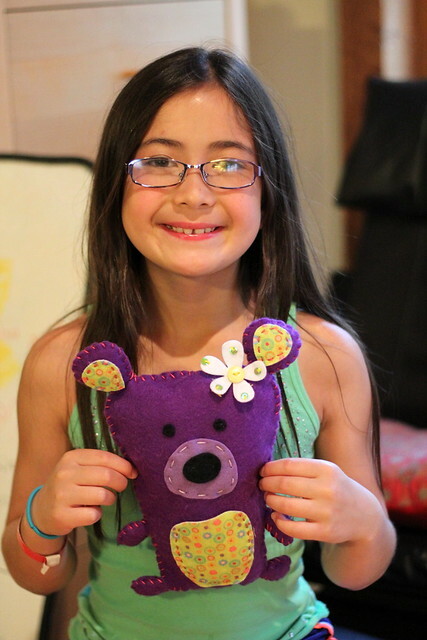 Here's her beautiful American Girl Crafts Bears Sew and Stuff Kit . Maybe she simply has more talent than I did, or sewing craft kits for kids have come a long way. Nice job! My girls love to sew. We've had them take classes at JoAnn Fabrics.